The day before our departure was dedicated to packing ... some last minute shopping ... tidying the apartment ... and keeping the stress levels as low as possible. We left ourselves plenty of time and even had some fun. Note that in the early stages, the beach toys had not yet made their way in. Some serious editing had to be done before they would fit. And I ended up with the craft bag and the journal ... which in the end are more for me than him anyway. What fun! I always let the kids pack a little bag too & now they start a few days before we go, carrying various bags around the house and filling them with goodies. It's a great way to figure out what's most important in their lives at the moment. Yah. Good tip. 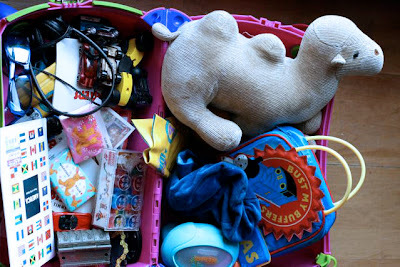 I also tuck away some favourites, hopefully unnoticed, for a week or two before the trip so the toys seem 'fresh' on the trip. I think that will be harder to do as he gets older though.